Trouble with sub-prime mortgages, declining home prices, and a seemingly weak job market have people fretting about a recession. 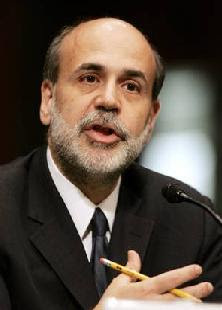 Almost everyone thinks that the Federal Reserve should come to the rescue by lowering interest rates. But that’s just because cutting interest rates is what the Fed has done in the past, and that is what seems to work. I think the Fed should stop caring about recessions. In fact, Congress should mandate so. UPDATE (11/15/07): The Wall Street Journal is warming up to my idea that the Federal Reserve should stop caring about growth. Read more here. My proposition rests on three elements. The first one is that a few banks are saddled with bad mortgage loans, but nobody knows which banks and how bad their loans are. The second one is that American economic growth depends heavily on consumption. The third one is that households are awash in debt. Lowering interest rates stimulates both private expenditures and investment. The Fed models show that expenditures account for 81 percent of the response (see this paper, Table 3), with investment representing only 19 percent. Consumption is the engine of the economy. But Americans are already spending with abandon. The household saving rate is at historical lows, no matter how you measure it. The only way to significantly increase expenditures is to borrow. That is rather difficult because the value of houses (net of mortgage balances) is low, so households don’t have much collateral to borrow against. But in the last five years the US economy has been stuck in a perverse cycle. Low mortgage interest rates have powered a home-buying frenzy. Increasing home prices have allowed home-owners to tap into their home equity to finance consumption. Expectations of further real estate appreciations have led to more home purchases, which pushed prices higher and financed more consumption, and so on and so forth. That treadmill has produced economic growth, but it has left us with record-level amounts of household debt (see chart) and a big trade deficit. More importantly, it is not sustainable. The current slowdown in inter-bank lending makes borrowing all the more difficult. During the real estate boom banks securitized their mortgage portfolios, putting those mortgages off their balance sheets. So right now nobody knows who holds bad loans and how bad they are. And, understandably, banks don’t want to lend money to insolvent institutions. That American growth is so dependent on consumption is not set in stone. Switching to a growth pattern driven by saving, investment and exports is not the Fed’s job. But the central bank can allow the economy to steer off the current path if it stops caring about recessions. But a mere promise by the Fed to tie its hands would not work: we need a Congress mandate. It would be difficult to commit to a self-imposed constraint. In the eyes of the Fed, the benefit of giving the economy a short-lived boost might outweigh the long-run costs. Plus, as we are seeing right now, the central bank is subject to great pressure from the markets. The institution is loudly criticized when it does not do what the markets think is right. And the chairman cares about those criticisms. He does not want to be remembered as “the guy who didn’t do anything for the economy.” He’s only human. Right now, the only thing that needs to be fixed is the paralysis in the bank system. First of all, banks should be required to disclose their off-balance loans. Chances are that the percentage of mortgages in default is small –banks did not issue that many sub-prime mortgages after all- and that the crisis is one of liquidity, not of insolvency. Once we restore mutual trust, banks will resume borrowing and lending from each other. Second, while confidence is restored, the Fed should continue to provide banks with as much liquidity as they need, at the current interest rates. Third, the government, not the Fed, should bail out creditworthy homeowners who cannot keep up with their mortgage payments. (Baker and Samwick have an idea about how to do that, and so does Glaeser. Politicians have their own too.) Many of those homeowners were sold creative mortgages, with low initial payments and variable interest rates. I am not sure they understood the contracts they were signing. Can the Fed be trusted to balance growth and inflation? Do we need an interest rate cut to stimulate inter-bank lending? Do the benefits of broad monetary discretion outweigh its costs right now? Leave your answers in the comments.